Today, the Franklin Silver Half Dollar Coin remembers when the Assembly of Georgia on April 11, 1768, chose Benjamin Franklin to act as their agent in Great Britain for affairs of the province. The members of the committee appointed to correspond with him were, James Habersham, Noble Jones, James Edward Powell, Lewis Johnson, Clement Martin, Alexander Wylly, John Mullryne, John Smith, Noble Wimberly Jones, John Milledge, John Simpson, Archibald Bulloch, William Ewen, and Joseph Gibbons, or any seven of them, provided two of the seven were of the Council. The appointment was annually renewed while he remained in England, and the salary was enlarged to two hundred pounds a year. And Be It Further Ordained that the said Benjamin Franklin, shall be and he is hereby fully Authorized and empowered to follow and pursue all such Instructions, as he shall from time to time receive from the General Assembly of this Province or from the Committee herein after Appointed to Correspond with him. And Be It Further Ordained that the Honorable James Habersham, Noble Jones, James Edward Powell, Lewis Johnson, and Clement Martin Esquires, The Honorable Alexander Wylly Esquire, John Mulryne, John Smith, Noble Wimberly Jones, John Milledge, John Simpson, Archibald Bulloch, William Ewen, and Joseph Gibbons Esquires, until others shall be appointed or any Seven of them. Two of which to be of the Council. And Be It Further Ordained that the said Benjamin Franklin shall be and Continue Agent for this Province for One whole year to Commence the First day of June next in the year of our Lord One Thousand Seven Hundred and Sixty Eight. 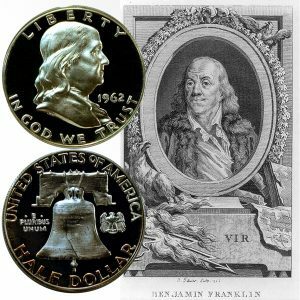 The Franklin Silver Half Dollar Coin shows with an image of Benjamin Franklin, circa 1782.